"Elvis Presley Memphis Recording Service Volume 1 1953-1954: The Beginning of Elvis Presley - The Birth of Rock 'n' Roll "
The Memphis Recording Service is one of the outstanding and most interesting releases of 2005. To differentiate it from other releases, its creator, Joseph Pirzada has come up with a beautifully presented tri-fold-out digipack package housing a book, DVD audio CD and 7" vinyl single! For the first time since 1954 we can hear Elvis' first commercially released single, That’s All Right, in its true Sun sound without the fake RCA echo. This track has been re-mastered from the original Sun Mother master straight to 5.1 Audio/ Dolby Digital sound. This original version has never before been re-released on record, CD or any digital disc until now. The 5.1 DVD Audio CD contains 11 fully restored tracks from 1953-1954. Each track has been remastered using never before released original sources of masters, acetates and tapes to produce the highest quality sound possible. AND IT SHOWS!!! The remastering was done by Mark Ritchie and Joseph Pirzada at Barefoot Studios in London. While Kevan Budd's "Elvis At Sun" compile gave us great sounding audio for Elvis' Sun Studio tracks, Memphis Recording Service gives us clear, vibrant sound not only with the studio recordings, but also the "live" Hayride performances. For some, That's All Right, sans the echo, will take some getting used to, but what a release! The Memphis Recording Service allows us to shut the blinds, turn out the lights, sit back and enjoy the early primal Elvis sound at its best! An archival photograph accompanies each song on the DVD Audio CD. The book element, The Beginning of Elvis Presley - The Birth of Rock 'n' Roll, features exclusive new information, unseen documents and color photos covering the humble beginnings of Elvis' music career and its effects on the birth of Rock’n’ Roll during 1953 -1954. Undoubtedly, the book's strong point is its many stunning color and b&w visuals and historic, archival reproductions of newspaper advertisements, billboard posters, reviews, program schedules and the like. From a photo of the pre-release acetate of 'That's All Right' to Scotty Moore's management contract with Elvis, Elvis' more complex first recording contract with Sun Record Company, Inc. and a series of fantastic photos taken at the Eagles Nest night club in Memphis, the visual aspect of the package will give you goosebumps! Various of the photos have only been published previously in black & white, and there is no doubt that in their "colorised" form they take on a whole new look and feel. "Elvis then went to see Ed [Leek], who lived at his Grandmothers house with the recording, hiding it in a flower bed outside the house. "I did it" Elvis told Ed. "Did what?" Ed replied, "I made the record". "Two days later on November 8th, Elvis made a solo appearance and played at the Memphis State University for a blood drive on behalf of the Student Government Association." With very good page design the text and visuals nicely complement each other. Interestingly, the page color is a pleasing yellow, and the paper is high quality semi-gloss stock. 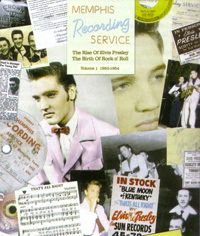 The book element also contains a 1953-1954 recording log and a list of Elvis' 1954 tour dates. The publisher has "sold out" of its copies of the first edition of the Memphis Recording Service and many suppliers are down to their last few copies of the the first edition. A second edition is planned. Verdict: Joseph Pirzada's Memphis Recording Service captures our interest with stunning and well balanced visual, narrative and aural elements. One of the finest releases of 2005. I for one can't wait for Volume 2 in the series!